Peanut butter and jelly not sweet enough for ya? Instead of topping it with sugar, try using cake instead of bread. Sure, good ol’ white bread might as well be made with sugar, but sometimes it’s best just to cut to the chase. 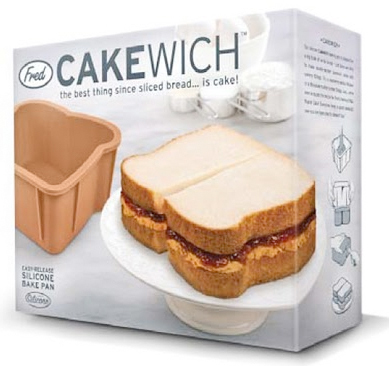 The Cakewich from Fred & Friends is a silicone baking pan shaped to look like sliced bread. Bake, slice and fill with your favorite sweet treats. Just be forewarned if you have a penchant for chocolate cake—somehow I don’t think adding turkey will too well mimic a turkey on dark rye. Back To School: Beer Fridge!